Friday Night Fish: 2013 Fan Favorite Fish Fry - Final Round Voting! 2013 Fan Favorite Fish Fry - Final Round Voting! Vote now for your Fan Favorite Fish Fry! Final Round - Now through 10pm, Friday, March 15th. 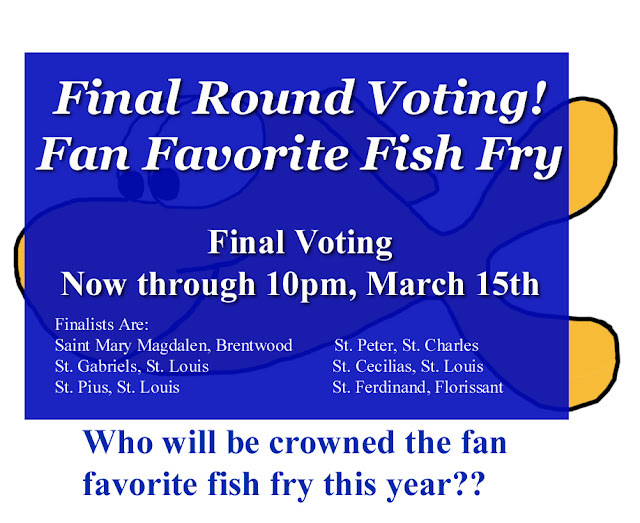 Who will be crowned the fan favorite fish fry for 2013! St. Gabriel! Great selection, fun atmosphere, real plates and silverware, and the people working the fish fry are wonderful! Ate at Holy Trinity Serbian last night and it was fantastic. Beautiful little auditorium with great atmosphere. Everyone was very friendly and the food was great. Three types of fish, broiled tilapia, fried tilapia, and fried catfish. Sides included green beans, very nicely flavored roasted potatoes, French fries, and onion rings. Full bar service as well. We arrived around 5:45 and there was no line, so another bonus. Highly recommend it, best this year!